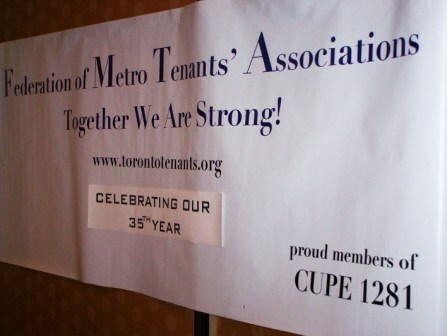 The Federation of Metro Tenants' Associations (FMTA) is a non-profit Organization which advocates for better rights for Tenants. Founded in 1974, we are the oldest and largest Tenant Federation in Canada. The FMTA is comprised of affiliated Tenant Associations and of individual Members. We have over 3,000 members and continue to grow. Check out the FMTA's 2008 Election page looking at How the Federal Parties Measure Up on their Housing and Tenant platforms. Our publications and resources for tenants are available on our Resources page. We have recently produced online and PDF versions of the Tenant Survival Manual and Guide to Tenant Rights in 12 languages! Both are Funded by the Law Foundation of Ontario.